The FHWA Office of Safety delivers safety data and analysis technical assistance through its Roadway Safety Peer-to-Peer (P2P) Program. The program's online application gives applicants the ability to ask for general assistance or for assistance related to specific FHWA safety data programs, initiatives, or common safety data topics. The Highway Safety Manual (HSM) provides transportation professionals with knowledge, techniques, and methodologies to quantify the safety-related effects of transportation decisions. The HSM facilitates integrating quantitative safety performance measures into roadway planning, design, operations, and maintenance decisions. Identify sites with the most potential for crash reduction. Identify factors contributing to crashes and associated potential countermeasures to address these issues. Evaluate the crash reduction benefits of implemented treatments. Conduct economic appraisals of improvements to prioritize projects. Calculate the effect of various design alternatives on crash frequency and severity. Estimate potential crash frequency and severity on highway networks, and the potential effects of transportation decisions on crashes. The Roadway Data Improvement Program (RDIP) helps transportation agencies improve the quality of their roadway data to better support safety and other improvement initiatives. The RDIP focuses on the content, process, and practices used by the agency for collecting, managing, and utilizing their roadway data. A technical assistance team reviews and assesses a state’s roadway data system for the content of the data collected, ability to use, manage and share the data and to offer recommendations for improving the roadway data. The RDIP also examines the State’s ability to coordinate and exchange roadway data with local agencies such as, cities, counties and MPOs. The RDIP is ultimately intended to help states improve the roadway data the State uses to develop their Strategic Highway Safety Plan (SHSP), which supports the State’s Highway Safety Improvement Program (HSIP). The Roadway Data Extraction Technical Assistance Program (RDETAP) is in development. 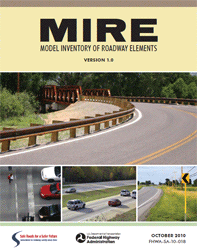 It is intended to assist states to identify and extract Model Inventory of Roadway Elements (MIRE) from commonly available existing sources of data, such as State video logs, Google Earth and Bing street view maps. The RDETAP will build upon a technique of data extraction that was pilot tested with the New Hampshire DOT as part of the MIRE Management Information System project in 2012-2013. The RDETAP will include a RDETAP Guide to provide instruction on how to extract roadway data and translate it into a state’s roadway inventory system. It will also provide direct technical assistance to state DOTs and local agencies (e.g., cities, counties, MPOs, LTAPs etc.) that need more "hands-on" instruction in how to use the data extraction techniques, with the intent that a cadre of individuals within that state are trained in how to identify and extract the data elements intended for collection. The technical assistance portion of the RDETAP is expected to be ready in the Spring of 2014. Focuses on roadway inventory data and its integration with crash and traffic volume data to enable use of state-of-the-practice safety analysis methods. Focuses on applications of state-of-the-practice safety analysis tools in safety management, planning, and project development processes. Focuses on policies, procedures, and personnel exist for the effective management of roadway safety data. Focuses on how roadway safety data relates to other data. Additionally, it considers whether existing data can be expanded as new technologies and tools are developed in the future, or as needs change. A virtual or onsite demonstration of software attributes, default value and result interpretation. This is a demonstration of software applicability and uses not an application to specific condition or circumstance. Technical assistance for local agencies, municipalities, counties, and MPOs that may have less robust safety data systems.